The Intel Developer Forum (IDF) kicked off this morning in San Francisco, starting with the keynote presentation by CEO Paul Otellini. Otellini talked about a "computing continuum" where the required attributes are "Engaging, Consistent,and Protected". On the last point, Otellini described a "partnership" with McAfee, though the company became a wholly-owned subsidiary in February. This mirrors Intel's approach to the Wind River acquisition, retaining the brand identity of the purchased company. running the Honeycomb OS, in a "computing continuum" demo at IDF. 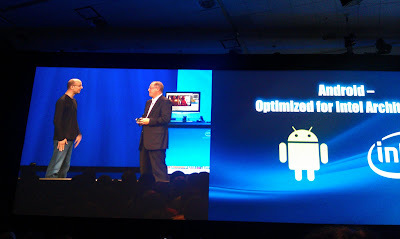 To demonstrate a computing continuum, Intel showed sharing of content from a Android-based smartphone and tablet, with images appearing on a "family wall". The PC is still at the center of the application connected framework, which Intel said will ship in devices such as a Toshiba Ultrabook PC by the holidays, enabling a consistent connected user experience. It is apparent that Intel is backing away from the Meego operating system, which they announced in a collaboration with Nokia just about one and a half years ago. With Nokia now moving to Microsoft Windows 7 mobile operating system, Meego is about to become another orphan OS. 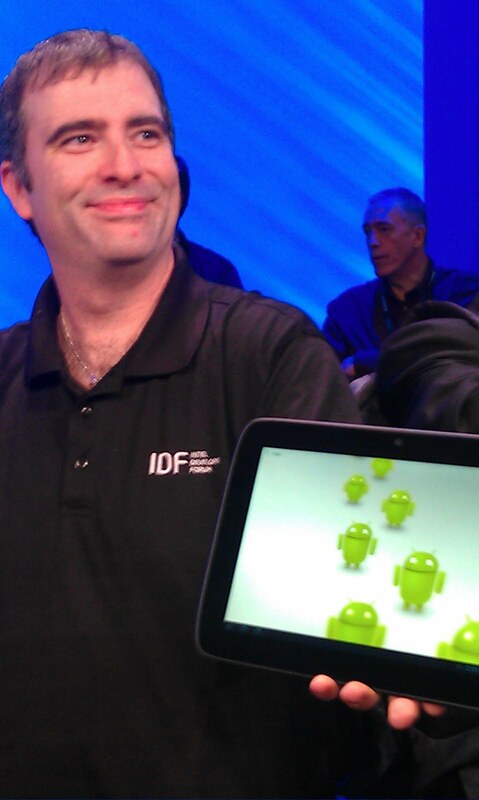 Nevertheless, Intel has two Meego-related sessions scheduled for later today and tomorrow at IDF. We have learned a lot of things about smartphone silicon and device design. We want to make the Intel architecture the platform of choice. Finally, Otellini announced a collaboration with Google, bringing VP of Android Engineering Andy Rubin onstage to declare that all future versions of Android will be optimized (no doubt non-exclusively) for the Intel architecture. With ARM-based processors continuing to dominate the mobile space, it will be interesting to see if this belated shift to Android bears fruit in the near future.